Today’s wind industry, even with the necessary batteries and other grid-scale storage, is energetically sustainable, Stanford scientists say. The worldwide demand for solar and wind power continues to skyrocket. Since 2009, global solar photovoltaic installations have increased about 40 percent a year on average, and the installed capacity of wind turbines has doubled. The dramatic growth of the wind and solar industries has led utilities to begin testing large-scale technologies capable of storing surplus clean electricity and delivering it on demand when sunlight and wind are in short supply. Now a team of Stanford researchers has looked at the “energetic cost” of manufacturing batteries and other storage technologies for the electrical grid. At issue is whether renewable energy supplies, such as wind power and solar photovoltaics, produce enough energy to fuel both their own growth and the growth of the necessary energy storage industry. Writing in the March 19 online edition of the journal Energy & Environmental Science, Dale and his Stanford colleagues found that, from an energetic perspective, the wind industry can easily afford lots of storage, enough to provide more than three days of uninterrupted power. However, the study also revealed that the solar industry can afford only about 24 hours of energy storage. That’s because it takes more energy to manufacture solar panels than wind turbines. Reducing energy inputs to battery manufacturing is also needed, he said. Over the years, consumers have learned to expect electricity on demand from power plants that run on coal, natural gas or oil. But these fossil fuels, which provide reliable, around-the-clock energy, also emit megatons of greenhouse gas that contribute to global warming. Wind and solar farms provide emissions-free energy, but only generate electricity when the wind blows or the sun shines. Surplus energy can be stored for later use, but today’s electrical grid has little storage capacity, so other measures are used to balance electricity supply and demand. In the study, the Stanford team considered a variety of storage technologies for the grid, including batteries and geologic systems, such as pumped hydroelectric storage. For the wind industry, the findings were very favorable. The results were especially good for onshore wind turbines. “We found that onshore wind backed by three days of geologic storage can support annual growth rates of 100 percent – in other words, double in size each year – and still maintain an energy surplus,” he said. For the solar industry, the Stanford team found that more work is needed to make grid-scale storage energetically sustainable. The study revealed that some solar technologies, such as single-crystal silicon cells, are growing so fast that they are net energy sinks – that is, they consume more power than they give back to the electrical grid. From an energetic standpoint, these industries “cannot support any level of storage,” the study concluded. The Stanford team’s primary focus was on the energetic cost of deploying storage on wind and solar farms. The researchers did not calculate how much energy would be required to build and replace grid-scale batteries every few years, nor did they consider the financial cost of building and installing large storage systems on the grid. “People often ask, is storage a good or bad solution for intermittent renewable energy?” Benson said. “That question turns out to be way too simplistic. It’s neither good nor bad. Although grid-scale storage of wind power might not be cost effective compared to buying power from the grid, it is energetically affordable, even with the wind industry growing at a double-digit pace. April 16, 2019 - A Safe Space for Bats: New technology reduces bat take at wind farms Windpower EngineeringGlobally, bat populations are in decline. According to Bat Conservation International, the International Union for the Conservation of Nature has deemed. 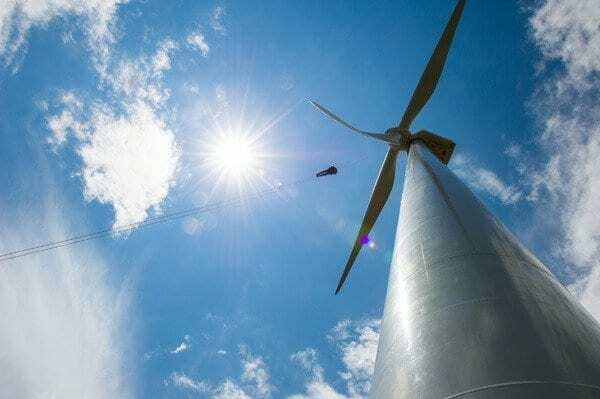 March 26, 2019 - As Global Energy Demands Grows, So Does Appetite For Offshore Wind ForbesOffshore wind capacity is forecast to grow by over 80 gigawatts (GW) through 2024 thanks to increasing global demand for energy and declining industry costs. March 21, 2019 - $35 million floating wind project gets green light CNBCTest site will be located near the town of Belmullet, County Mayo.